Many vegetables are commonly consumed raw, as well as cooked. In general, raw vegetables are bright in color, juicy and fresh flavored. However, there are some vegetables that are seldom eaten raw. The potato is one of those. Although they can be eaten raw, their starchy texture and slight bitterness are unappealing to most. 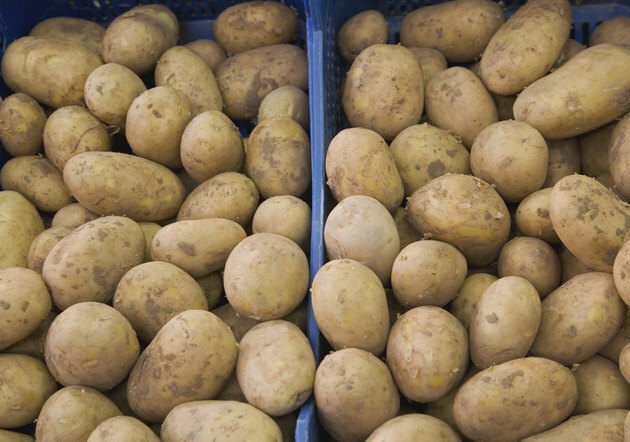 Raw potatoes are not inherently toxic, but there are many reasons to treat them with caution. Potatoes are essentially a nutritional warehouse. Their natural purpose is to supply food for the next year's potato plants, and this is also why they're so useful to humans. Most of the food value of a potato is in the form of starchy carbohydrates. Carbohydrates are one of the human body's primary fuels, but we digest raw starches poorly. Like those in grain, the starches in potatoes are indigestible and provide little nutritional value unless they have first been cooked. Because they are indigestible, uncooked potatoes pass through the upper intestine with little change. They arrive in the lower intestine largely intact, where they begin to ferment under the influence of intestinal bacteria. The result of this fermentation is the production of gas, which can cause bloating, cramping and flatulence. Although none of these effects are a threat to health, they are uncomfortable and inconvenient. Any raw food represents a risk of foodborne illness. Ilnesses are caused by a small percentage of bacteria and other microorganisms, referred to as "pathogens," that are frequently present on foods. Cooking vegetables prevents illness by heating and killing the pathogens. Any vegetable eaten raw should first be washed thoroughly and then peeled, if appropriate. In the case of potatoes, care must be taken to remove all traces of soil from the skin. Potatoes are a member of the nightshade family, along with tomatoes, eggplants, peppers and tobacco. All members of this family are known for protecting themselves with toxic alkaloids, and potatoes are no exception. They produce two alkaloids, solanine and chaconine, that are dangerous to humans. Ordinarily, a potato contains only small amounts of both. However, sprouted or green potatoes can have unusually high quantities of solanine. Solanine causes diarrhea, nausea, cramping, headaches and in extreme cases organ failure and death. Green potatoes should not be eaten, either raw or cooked.